Jan Dennis came to Manhattan Beach 56 years ago from a town in Connecticut that was rich in history. While here, she began to wonder about the history of our city, only to be frustrated to find few answers. As mayor some 30 years ago, Dennis found herself frequently saying "someone ought to write a history" of Manhattan Beach. Finally, a colleague said: "You want a book, go write it!" So she did. 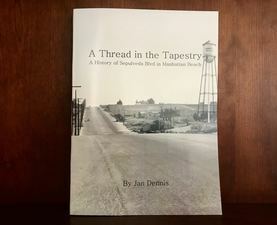 And now Dennis has just completed her eighth book on Manhattan Beach history, "A Thread in the Tapestry: A History of Sepulveda Blvd. in Manhattan Beach." Sunday afternoon, Dennis spoke to an intimate group, including current Mayor David Lesser, at pages: a bookstore downtown, sprinkling in personal anecdotes along with tales from her new Sepulveda Blvd. treatise. While the book is ostensibly about a road, it's chock full of characters – especially women prominent in our city's early history. For instance, Mrs. Clara Auchmoody, who owned property running from 1st to 6th St. east of Sepulveda, was a driving force behind the eventual paving of Sepulveda, which was just a dirt road for the city's first decades. Mrs. Auchmoody was a colorful and contentious character, operating a goat farm on some of her land (giving it the name "goat hill," which remains today in the name of a small shopping center), fighting the city over water rights and, ultimately, pushing through a plan to widen Sepulveda. Mrs. Auchmoody and other property owners along Sepulveda surrendered 10 feet of their property to encourage the building out of the road as a major thoroughfare. What Auchmoody and others didn't quite expect at the time was for Sepulveda to become a commercial corridor, Dennis said. They largely wished to build housing along the road, with the idea that commercial activity would be focused in downtown Manhattan Beach and along the road now known as Aviation Blvd. The full road that came to be Sepulveda began in Long Beach, continued west toward Redondo Beach, and shifted north through Hermosa, Manhattan and El Segundo, all the way up to the Valley. While sections have been renamed or slightly shifted, Manhattan Beach's segment has retained its historical name. Sunday, Dennis gave a glimpse of the way Manhattan Beach grew from a seaside vacation community to more of a self-sustaining city. Initial development was all by the water – but not too close, due to fears of "tidal waves" – and the town was entirely dependent on groceries and supplies coming in by rail. Soon, however, farmers saw the opportunity to develop East Manhattan Beach by growing crops and raising animals, eventually making East Manhattan "the breadbasket of Manhattan Beach." There were even farmers raising minks, foxes and chinchillas for their pelts. Of course, the farm community of East Manhattan gave way to residential development with bigger lots and larger homes. Dennis recalled arriving in Manhattan Beach and seeing the slogan, "There's No Life East of Sepulveda," but she's made it a major project to describe that there is plenty of history there... and along the whole road through our town. All of Dennis' Manhattan Beach histories are available at pages: a bookstore downtown.